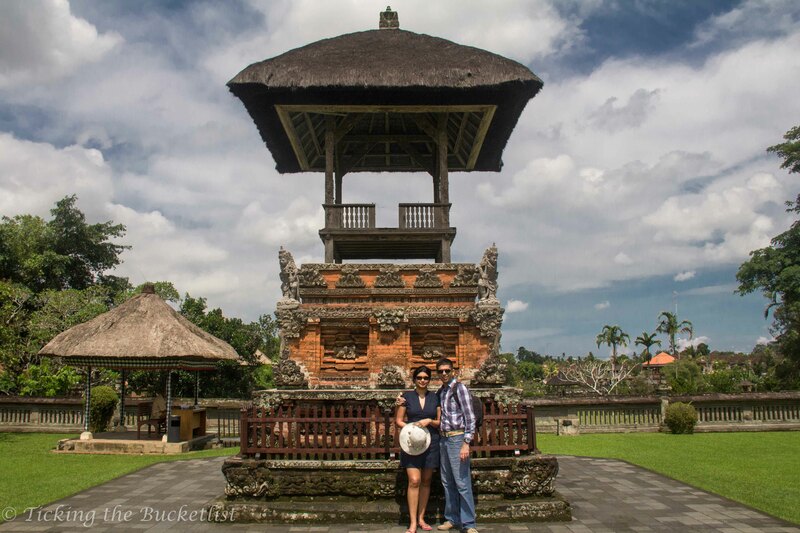 Ticking the Bucketlist » Templed Out in Bali! It is said that there are more temples than houses in Bali. I am not sure whether this is true… but I do know that there are lots and lots and lots of temples in Bali. There are temples for the main Gods, for the smaller deities, for those who protect the town and the fields and many more. 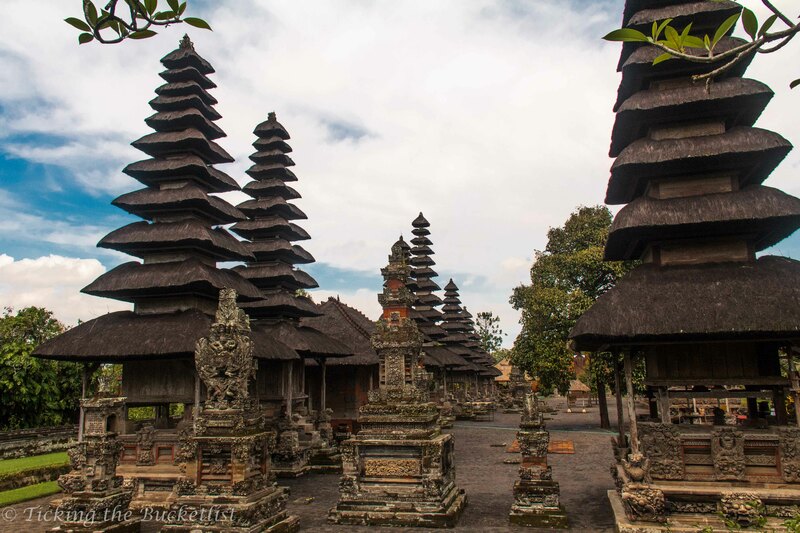 Had we been on a two week trip to Bali, I would have spent unending hours, wandering through these temples. However, considering that we were on a rushed three day trip, I picked three key temples that I wanted to see as we drove around the island. Needless to say, Ankur found me wandering into the smaller ones quite often and had to pull me out. Being the culture-vulture that I am, this was expected, wasn’t it? The Tanah Lot Temple, better known as the Sunset Temple by the tourists, is one of the most visited and photographed temples in Bali. Located on the West coast of the island, the temple stands majestically on a rock, off the coast and can be reached only during low tide. Hence, it is important to know when the low tide will set in as you plan your day. That being said, the place will be crowded by tourists regardless of time of the day, more so during the sunset hours. The silhouette of the temple against the colourful sky at sunset is breathtaking and results in postcard like pictures even with a standard point and shoot camera. For those who aspire to see the interiors of this temple, please note that it is open to Balinese Hindus only. For those who are charmed by snakes, there is a ‘Holy Snake’ that can be seen in a cave opposite the temple by paying a small fee. Hailing from the land of snake charmers, Ankur and I chose to give this bit a skip and watched the animated faces of fellow tourists as the entered the cave. The entrance ticket to the temple costs about USD 2.5 per person (foreigner) and the parking fee is about USD 1.5 per vehicle. The temple is few hundred meters from the parking lot. Narrow lanes leading to the temples are lined with souvenir shops selling masks, cane hats, batik printed fabric, cotton clothing, incense sticks, scented candles etc. 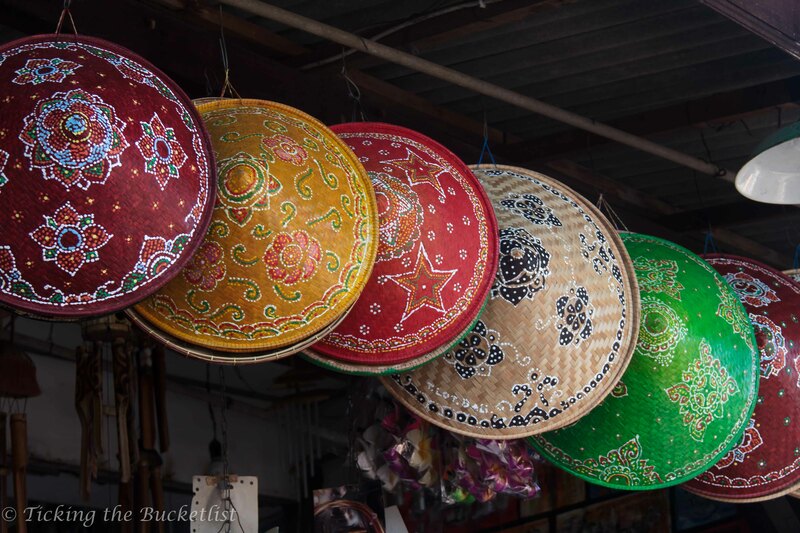 It was a great place to pick up a few knick knacks – reasonable prices without too much of haggling. Taman Ayun, literally translated means ‘beautiful garden’. The Royal Temple is surrounded by vast manicured lawns which ensures that everyone visiting the temple gets a little corner to find the peace and tranquility that he/she is looking for. The temple was built in 1634 by the ruler of the Mengwi dynasty and is supposed to be one of the most beautiful temples in Bali. The temple is surrounded by canals and appears to be built on an island in the river. The temple complex is broadly divided into four courtyards, each at a level higher than the other. As we entered the first courtyard by crossing the moat, we couldn’t get our eyes off the ‘merus’ that seemed to be the most important structure of the temple complex. These tiered pagodas are dedicated to the Hindu Gods and protect the island from evil spirits. The largest, eleven tiered meru at Taman Ayun is dedicated to Dewi Sri – the Goddess of Rice. The temple complex has an entry ticket of about USD 1.5 per adult. However, the courtyard housing the merus is not open to public and can be viewed only from a distance. While you can spend less than 30 minutes and ‘see’ the temple, we would recommend that you budget at least an hour. Its a perfect place to do some soul searching! The Monkey Temple in Ubud is on every tourists’ list; it wasn’t on our list. There are so many temples in India where monkeys feel at home that we couldn’t find the motivation to go there and decided to visit the Saraswati Temple instead. 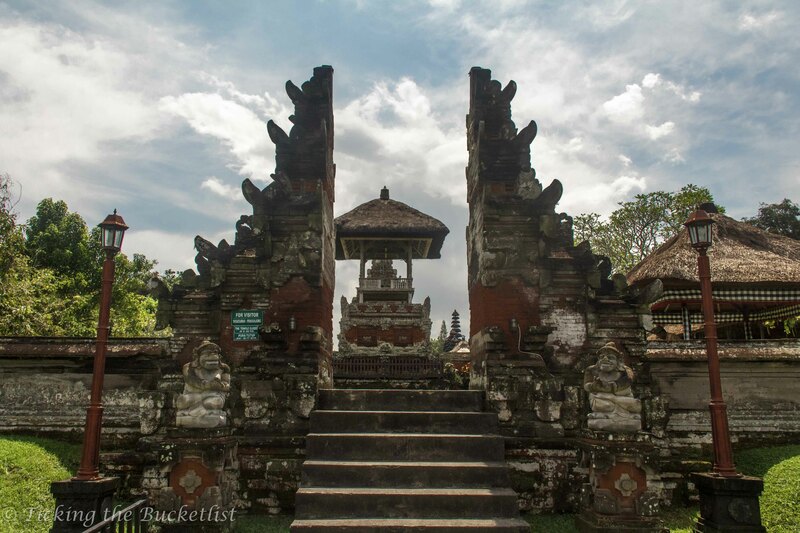 It is surprising that very few tourists know about the Saraswati Temple in Ubud. Our driver did not know about the place either. 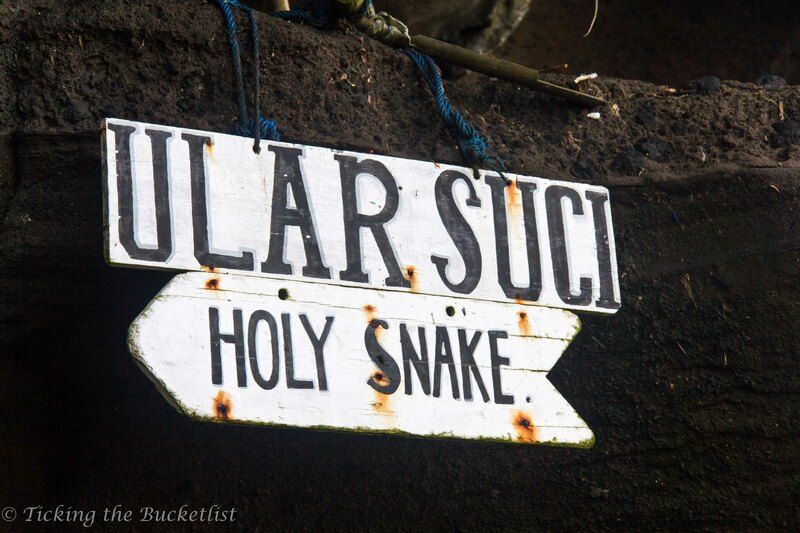 We finally got some directions after we reached Ubud. This was my favourite temple in Bali; ditto for Ankur. The bright orange temple structure was surrounded by a pool full of lotuses. 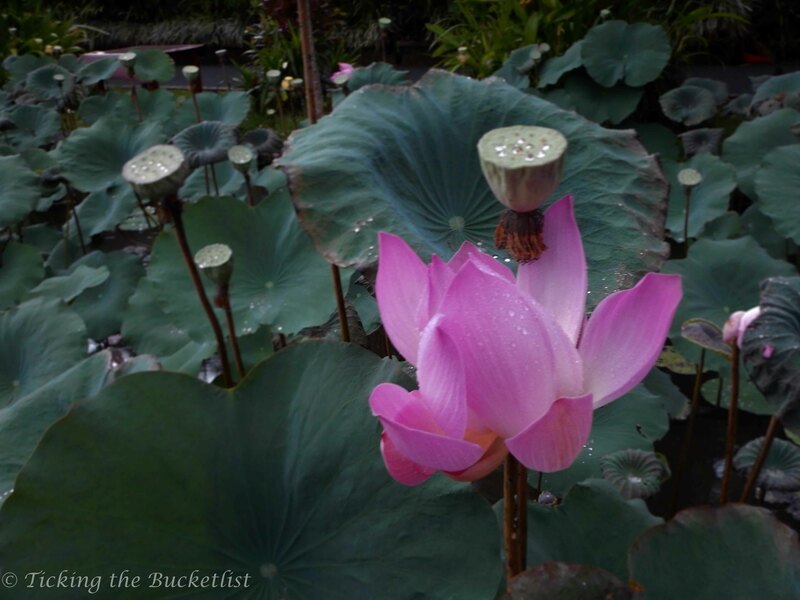 Ankur and I have never seen so many lotus flowers in a pond… it was such a lovely sight! For those of you who liked the picture above and intend to visit this temple – it is right next to the Starbucks on the Monkey Forest Road in Ubud. There is a restaurant that has tables overlooking the pond – perfect setting for an authentic Balinese meal! Have you been to any temples in Bali? Which one was your favourite? I haven’t been to Bali yet but I felt templed out in Bangkok. There are alot of temples there too. They look quite different from the ones in Bali though. Bali is absolutely an incredible spot to visit. You’ve done a wonderful job capturing the feeling of the country with your photos. The temples look amazing! We have been to Bali. We really loved it too. Uluwatu temple was of our favorites. The setting up on a high cliff is breathtaking. But so many of Bali’s temples are amazing. This is a great list! I also felt like I saw a lot of temples in Bali, but the only one on my list that matches yours was Saraswati! I wandered many of the temples in Ubud and loved them but my favorite temple in Bali was Pura Ulun Danu Bratan. I’ts very pretty on the lake. 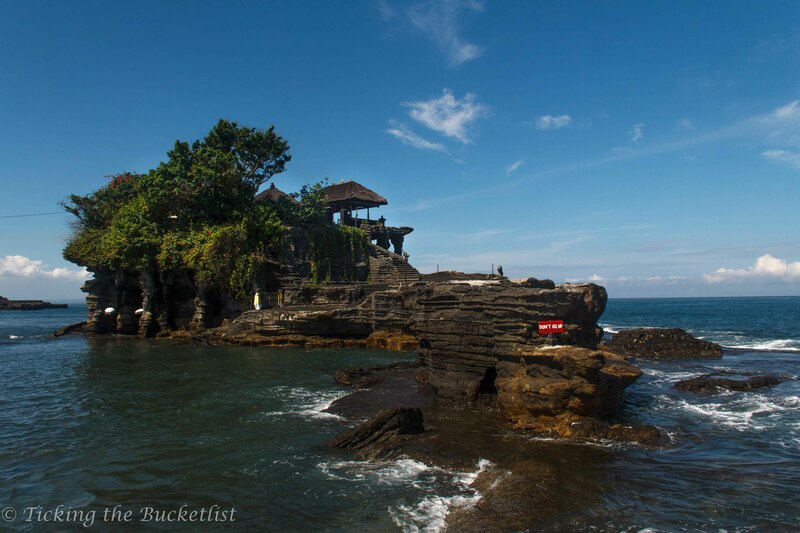 If I go back I would love to Tanah Lot. Your pictures are amazing! We just got back from Thailand so we understand what you mean about “Templed out”. That being said, these three choices look fabulous. The sunset temple reminds me of Mont Saint-Michel in France because it’s only accessible in low tide. Loved the little pad garden too. That looks absolutely magical. 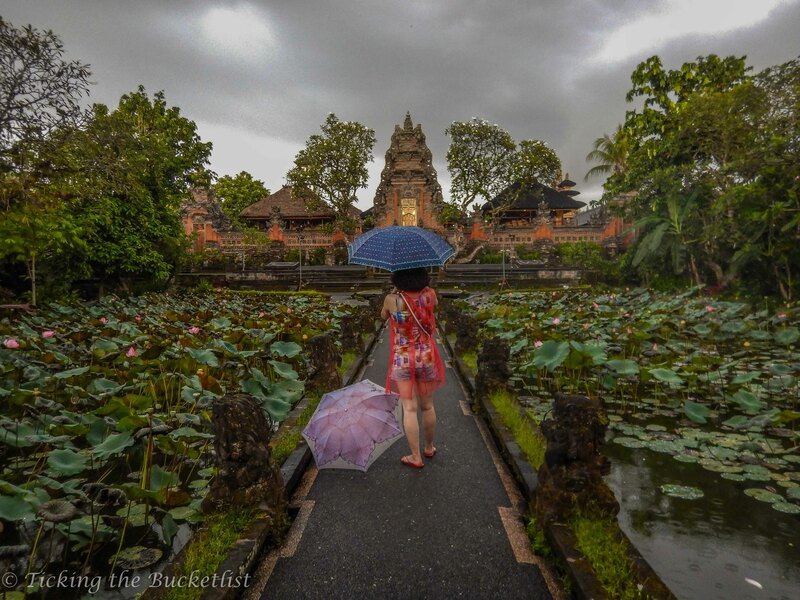 I’m so sad I missed the Saraswati Temple while I was in Ubud. I was near it too and I’m kicking myself in the head because your photo is amazing! I didn’t know Tanah Lot was popular for sunsets but it was just as pretty midday. I have always dreamt about visiting Bali. What is the best time to visit and what would you say is a minimum stay to see what there is to see? How did you like the local food? Great photos btw! That was great to read about top 3 temples of Bali. I am sure people on short visits will find it very useful as they now know what to visit and what to skip. I cant help noticing how different each of these temples are from each other.